"I'm sorry it had to end like this," a crying Osaka said. Williams - who was aiming to equal Margaret Court's record of 24 Grand Slam singles titles - said she had not received any tactics from Mouratoglou, telling the umpire she would "never cheat to win and would rather lose". The Frenchman later admitted that he had been coaching from the box. "You are a liar. You will never be on a court of mine as long as you live. When are you going to give me my apology? Say you are sorry," she told the Portuguese. That led to Ramos docking her the next game - leaving Osaka just one more away from victory at 5-3 up. Williams later accused the umpire of sexism, saying: "He's never taken a game from a man because they said 'thief'." Williams is a national icon in the United States, as well as a global star, and had the backing of the 24,000-capacity Arthur Ashe Stadium. But the boisterous crowd was quietened as Osaka came out firing at the six-time champion. Osaka, playing in her first Grand Slam final and against her idol, showed no fear as her aggressive approach led to multiple Williams errors. Williams' first-serve percentage was down at 38% and made 13 unforced errors as Osaka broke for 2-1 and 4-1 leads on her way to the opening set. The Ashe crowd, while remaining respectful towards Osaka, was already upset with the way Williams had been treated - and unhappiness turned to anger during the drama of the second set. Security staff ran on to the perimeter of the court as Ramos walked off and the Portuguese did not return, as he would usually have done, for the trophy presentation. More boos followed at the start of the ceremony, leading to Osaka pulling her visor down over her eyes to hide her tears. Williams appealed for calm in her runner-up speech, asking her supporters to "give credit" to Osaka's achievement. The Japanese player composed herself as the crowd began to applaud her, although she almost dropped the trophy as she walked off the stage. "It was always my dream to play Serena in the US Open finals so I am really glad I was able to do that," she said. 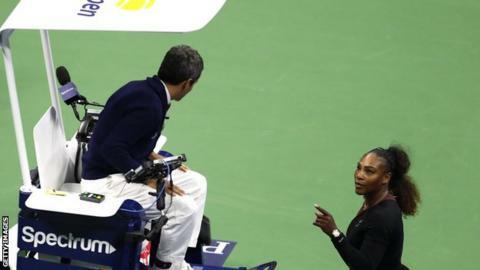 "This has happened to me before, this is not fair," Williams told the umpire after she was docked the point for racquet-smashing, apparently referring to two previous controversies at US Open matches. The American received a point penalty on match point of her 2009 semi-final against Kim Clijsters following a tirade at a line judge. The Belgian was two points from victory when Williams, who had earlier been given a code violation for racquet abuse, was called for a foot fault. Williams launched an angry outburst at the official and got the point penalty, meaning Clijsters won 6-4 7-5. That incident left Williams on a two-year probation period, so she was fined $2,000 (£1,265) for abusing umpire Eva Asderaki during the 2011 final, where she lost to Australian Sam Stosur. "If you ever see me down the hallway look the other way," she told Asderaki. "You're out of control. You're a hater and you're just unattractive inside." In recent years, Serena Williams has rightly been lauded for speaking out about discrimination faced by women and the black community. Her voice has become a very powerful one, but this latest US Open outburst does not reflect well on her. Incensed at being warned for coaching, as she felt her character was being called into question, she initially made her point forcefully - but politely - to Carlos Ramos. Many umpires might have turned a blind eye, as the rule is widely flouted, but Williams' coach Patrick Mouratoglou has admitted he was trying to send her a message. When Williams broke her racquet in anger, Ramos had no alternative. A warning is followed by a penalty point. This is when the 36-year-old started to lose her cool. Jabbing her finger angrily in Ramos' direction, she called him a liar and a thief and suggested she would make sure he never umpired any of her matches again. Anything that questions an umpire's honesty has to be penalised and credit to Ramos for having the courage to make that call against the greatest player of all time as she chased history on home soil. The presentation ceremony began in a poisonous atmosphere, until Williams took the initiative. She put her arm around Osaka, congratulated her and asked the crowd to stop booing. American former world number four Brad Gilbert: This is so sad and especially for Osaka on her tremendous level throughout the tournament. The coaching violation was ridiculous - [Serena Williams] never saw it and it looked liked absolutely nothing. Seen 50x worse and not called. Osaka was two games from the finish line, let the match play out. British number four Liam Broady: I think incredibly strong from the umpire to not be intimidated by a GOAT [greatest of all time] of the game and hand out the game penalty. You shouldn't talk to anybody in this way whether they're an umpire or person on the street. Absolutely gutted for Osaka. Has had this moment snatched away from her, hardly smiling lifting the trophy. Canadian tennis player Vasek Pospisil: What a disappointing way for a US Open final to end. Serb former French Open champion Ana Ivanovic: What a performance by Osaka!! So strong and composed and what a champion Serena is! British former number one Greg Rusedski: A new star is born in the women's game! What a performance from Naomi Osaka. She stood toe to toe with Serena Williams. All the headlines unfortunately will be about the point, game penalty & chair umpire, but we should remember the extraordinary performance from Naomi Osaka. American former US Open champion Andy Roddick: Worst refereeing I've ever seen... the worst!!! British former tennis player Andrew Castle: Serena Williams was fined $175,000 after the 2009 US Open semi-final meltdown v Clijsters. This will be hefty too. Not sure how any unbiased observer who knows the rules and history of tennis can look at what happened and defend Serena. American 12-time Grand Slam singles champion Billie Jean King: When a woman is emotional, she's "hysterical" and she's penalised for it. When a man does the same, he's "outspoken" & and there are no repercussions. Thank you, @serenawilliams, for calling out this double standard. More voices are needed to do the same. Two-time Grand Slam champion Victoria Azarenka: If it was a men's match, this wouldn't happen like this. It just wouldn't.